A simple quote from a song on Today’s Special says so much. The fall semester is almost over, with only a week of finals left to go, and then three weeks of sleep, work, and whatever else we want to do. During the fall semester this year, we’ve learned about many things… pink flamingos, a man throwing a brick over his shoulder, what happens when professors get canine companions they don’t want, and how to smooth-talk our way into overrides. Web Cams, video cameras, digital cameras, and even security cameras, document life at college quite accurately. For instance, let’s take these three people, who, left to right, are Danielle, Erika, and Matt. 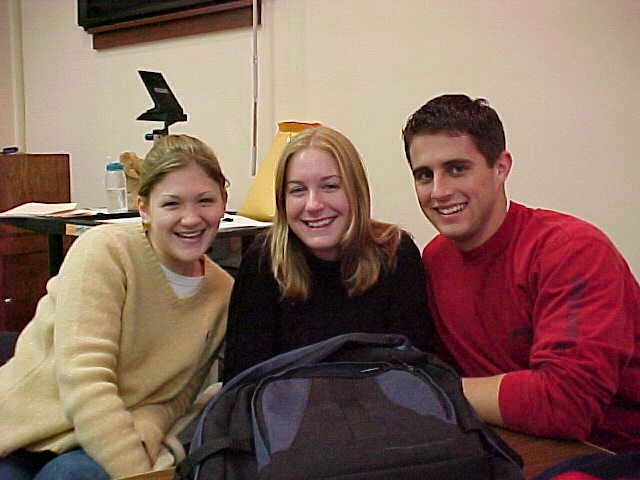 These three and myself all shared a table in COB 202, also known as Interpersonal Skills, in Zane Showker Hall. Through in-class activities, as well as the usual chit-chat before class, I have come to know these people very well. We all discuss how our weekends were, how breaks went, and so forth. Danielle and I each had the opportunity once to lead each other through Zane Showker Hall while the other had their eyes closed in an exercise on trust. That was fun. 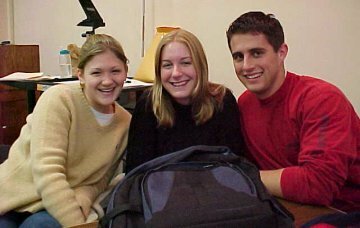 Still, life in college is fun, where you meet new people, have new experiences, and hear the stories of other people’s wacky adventures (and even have wacky adventures of your own). Christmas break is almost here, and then on January 7, everyone comes flocking back, in order to begin it all again.